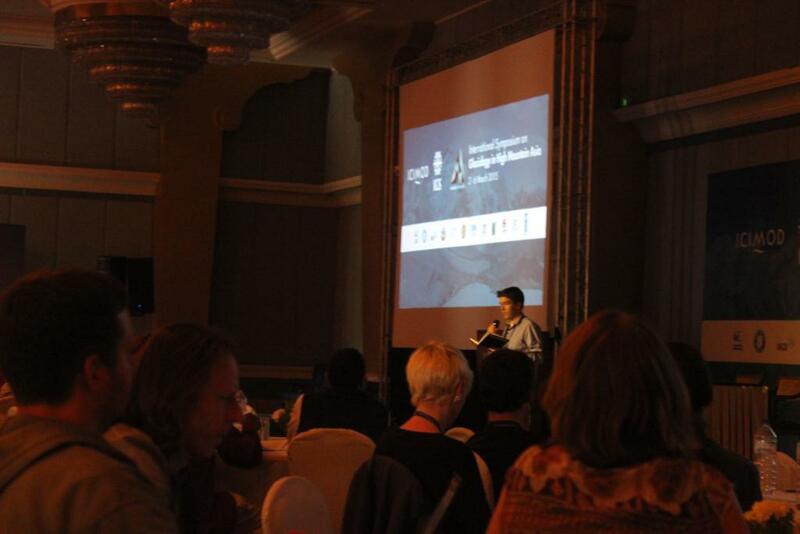 From 1-6 March the Symposium on Glaciology in High Mountain Asia (HMA) was held at the Yak & Yeti in Kathmandu, Nepal. Attendees from our research team were Joe Shea, Patrick Wagnon, Walter Immerzeel, Francesca Pellicciotti, Emily Collier, Pascal Buri, Evan Miles and Philip Kraaijenbrink. The great gathering of glaciologists that are working in the HMA provided ample room to talk to one another and to get to know each others current research aims, to discuss about new research ideas and to pave the path to new collaborative studies. All of us presented recent work in talks or during one of the poster sessions, showing what we believe are our strong and novel research focuses in this field. Francesca presented the modelling of the debris-covered Lirung Glacier using the TOPKAPI model and the estimation of debris thickness from UAV imagery. Walter spoke about his key work on the future glacier melt peak and its implications to the Indus and Ganges basins. Emily showed her efforts on modelling high-altitude precipitation in the Langtang Catchment using the WRF model. The student talks of Pascal, Evan and Philip on Thursday (March 5th), respectively on ice cliffs, supraglacial ponds and UAV monitoring, were labelled by many as being among the most interesting student talks. The latter even won the ‘best oral presentation of a student‘ award and the accompanying €250 prize. Map with pins denoting the research area of all conference attendees (source: Twitter #IGSKTM). The conference showed us that we have come a long way in recent years in terms of a focus on HMA. Previously, glaciological studies in this region were scarce. At the moment, a quite substantial amount of in situ measurements have been taken, extensive remote sensing analyses are being performed and process-based modelling efforts are made. In the coming years it is time for the community to integrate the various aspects of glaciers in HMA we have studied so far to learn more about the small and large scale hetereogeneous behaviour of the glaciers in the region and the causes thereof. An improved quantification of smaller scale glacier processes and incorporation into the larger scale analyses will help us to better understand the environmental, economical and social implications of climate change in this region. Currently there is a strong focus on the glaciers in the Karakoram, Langtang and Everest regions. The field might be served well by spatially spreading research efforts more, especially if to catch and explain the observed heterogeneous behaviour of the glaciers in HMA. Joseph Shea’s closing words (source: Twitter #IGSKTM). Overall we think the conference has been a success and has contributed greatly to the community by setting the research standards and goals for the coming years. We therefore would like to thank our fellow team member Joseph Shea for the tremendous efforts he has put in as the chief of the organizing committee. Group photo of the conference attendees in the atrium of the Yak & Yeti (source: Twitter #IGSKTM).